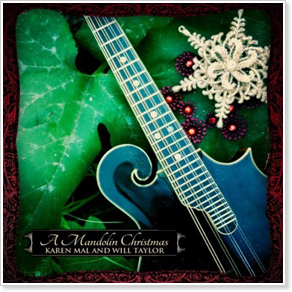 A Mandolin Christmas with Karen Mal and Will Taylor is a collection of fresh arrangements for guitar and mandolin just out in time for the holidays. The jazz flavored classical guitar style of Taylor with the more traditional folk style of Mal's mandolin is the foundation for a refreshing new take on some favorite holiday classics. The cover is so beautiful that I would buy the CD just for that! Sounds good, too; a nice change from the stuff you hear on commercial radio and in the malls.